I’m Gonna Pump(kin) You Up! With Halloween rapidly approaching it’s time to make a final push through my fridge and clear out the remaining pumpkin beers. I am going to have one last blind tasting coming up, but for now we’re looking at another couple of beers I picked out to just enjoy on their own. 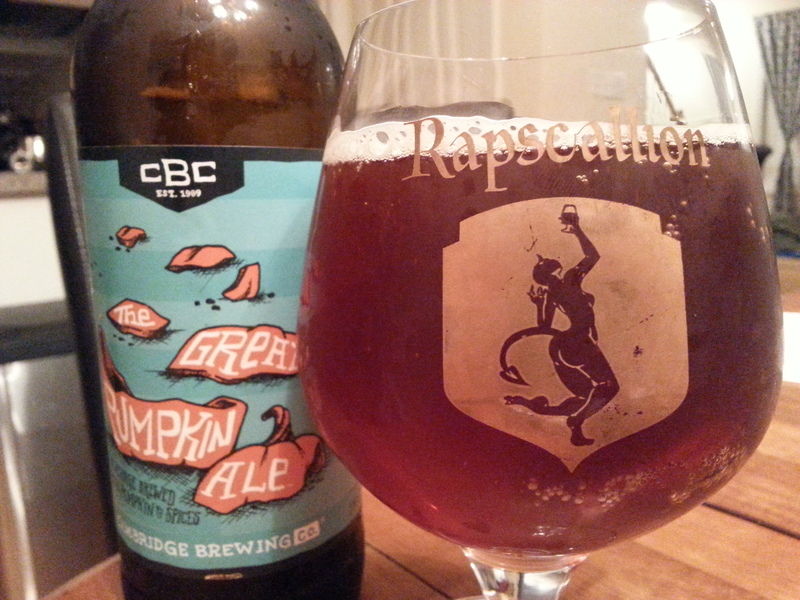 Up first was The Great Pumpkin by Cambridge Brewing Company. It poured an orangish/dark amber body with a thin off white head. The smell was a mix of sweet malts and pumpkin. Pretty much par for the course so far. The taste was a bit more intriguing. It started out with smooth vegetal pumpkin followed by a bit of fall spices. These spices then faded away as the beer transitioned to a rather complex finish that combined sweet malts, hints of vanilla, and an ever so slightly boozy ending despite being only 5.4%. Mouthfeel was medium plus with not much carbonation and complimented the rest of the beer quite well. Although the spices and vanilla finish can build up a bit at warmer temperatures, they never get to the point of dominating the beer or risked throwing it off-balance. I enjoyed this one and will continue to make it part of my yearly must haves. 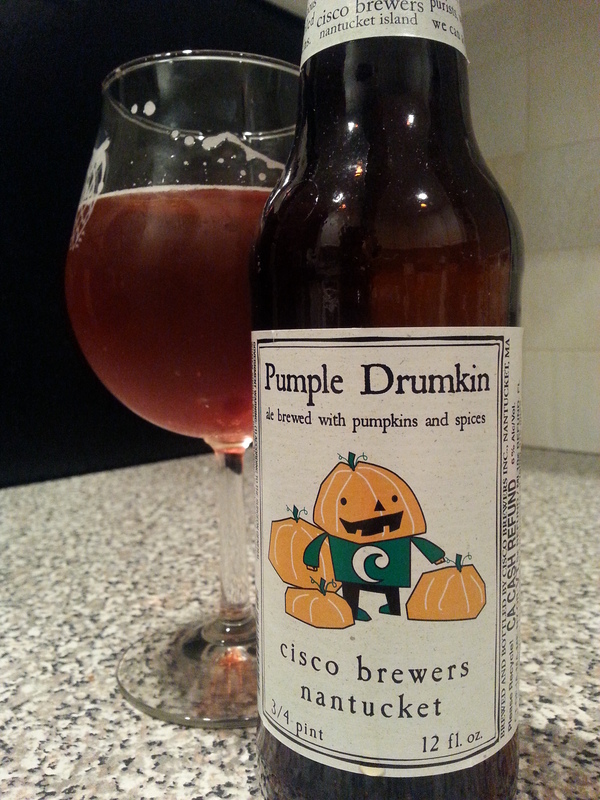 Beer number two was Pumple Drumkin by Cisco Brewers Incorporated. This was the other co-favorite from last year and I had been eagerly anticipating its appearance in this year’s tasting. Checking in at 6.0%, it poured a darker amber/brown body with only a thin, fizzy quick to dissipate head. The smell was all sweet malts and didn’t really give away any hints about this being a pumpkin brew. As for the taste, it was by far the hoppiest of the pumpkin beers I have had to date. Upfront there was a mild earthy hop bitterness followed up by sweet malts and subtle pumpkin tastes in the middle. It finished with a very light cinnamon/nutmeg/all spice combo that blended into the pumpkin flavors and was offset by just a bit more hops. The beer was medium bodied and moderately carbonated, more in line with a typical IPA than a lot of the other pumpkin beers I’ve sampled. I really liked this beer as sort of Pumpkin Ale/IPA hybrid. It was a bit spicier on the finish than I remember it being, but this is still a beer I will continue to make a part of my fall season. 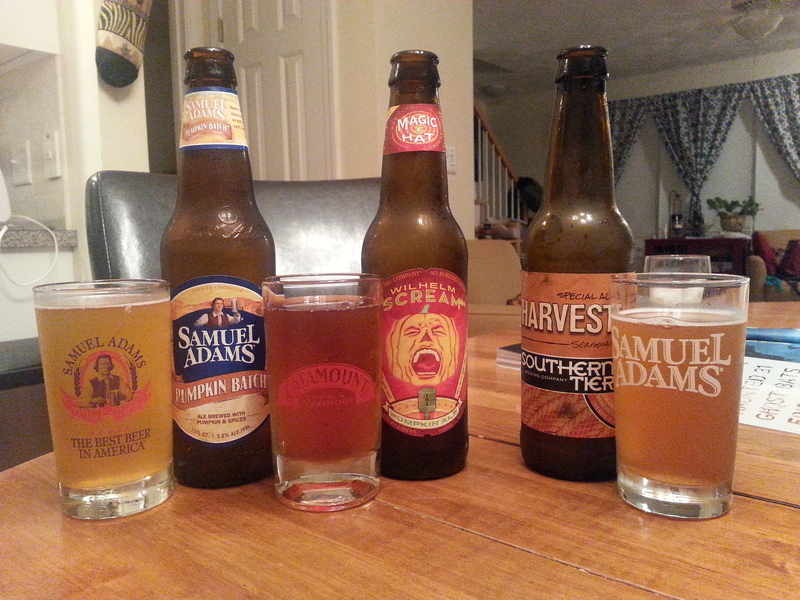 So that rounds out this latest round of pumpkin tastings. Again, there will be one more set of reviews before I reveal my final rankings and provide some final thoughts on the pumpkin experiment. Hard to believe it is already mid-October! 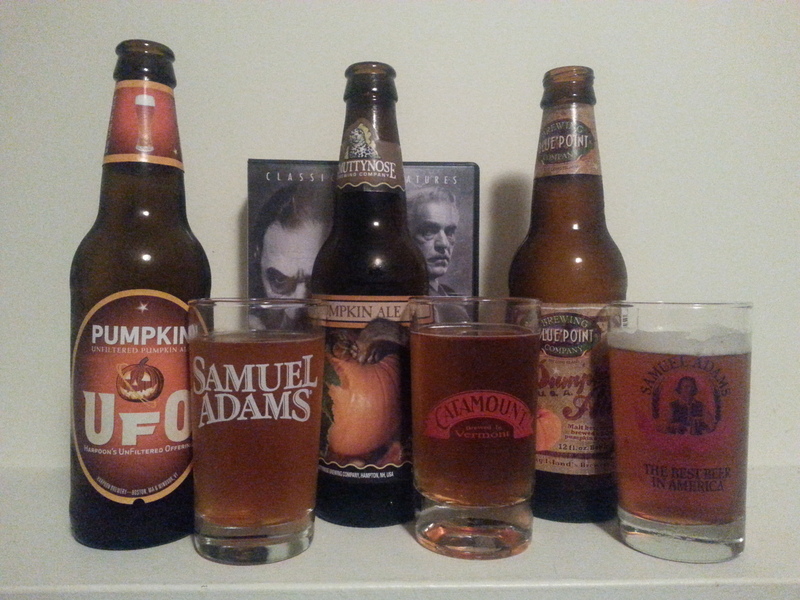 Pumpkin beer season is probably now at its height, so it seem to be an appropriate time to report in on two more. Unlike the other reviews so far, these beers were not tasted blindly. One was ordered while out running some errands and the other was a long-standing favorite that I just couldn’t pulling out of the fridge. So, without further ado, here are the latest two entries into my pumpkin patch. The first beer to report on this time around is Slumkin Pumpkin, by Slumbrew Brewing Company. We happened to be in Assembly Row running an errand the other and my wife suggested we stop by the American Fresh Taproom to grab a beverage before heading home. I hadn’t been there in a while so I wasn’t about to pass this up. They seemed to have a good number of beers pouring that particular night, but sitting prominently among the beers I hadn’t tried before was a pumpkin beer. I felt committed at this point, so the pumpkin beer it was. Happily, it was pretty good. Checking in at 6.5%, it poured with a typical orangish copper body and a foamy white head. The smell hinted at a promising vegetal sweet taste profile, something that has done well for me so far. The taste did follow-up on this and was overall pretty smooth with vegetal pumpkin tastes upfront, a transition to sweet malts and finally a vanilla/pumpkin spice finish. What made this beer so good for me was that the spice finish wasn’t overdone, though it did build up a bit as the beer went on. 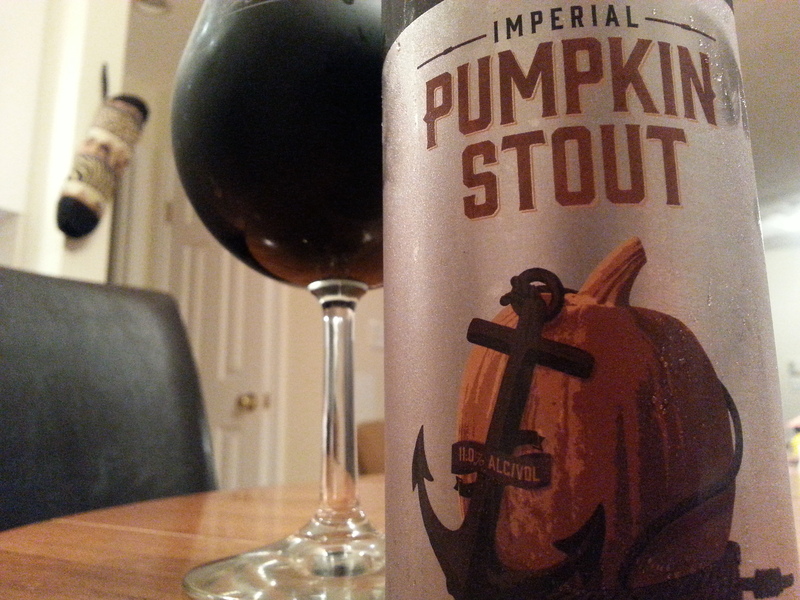 The mouthfeel was pleasingly thick and creamy and brought to mind thoughts of pumpkin pie. One of the better pumpkin beers I’ve had this season. The second beer I have to report on was last year’s co-favorite, Cape Ann Brewing Company’s big 11.0% Imperial Pumpkin Stout. This one is completely different from any of the others I’ve listed on here so far. It poured dark and black, though I couldn’t coax any more than a thin fizzy head out of it. The smell is vegetal and sweet, mixed with just a bit of alcohol as the beer warms. The taste, though, is where the beer really starts to impress. Upfront is strongly vegetal pumpkin. The pumpkin remains throughout the beer, though it transitions to a more of sweet pumpkin syrup-like taste by the end. The pumpkin combines with both sweet and lightly roasted malts and comes to a somewhat boozy finish. There was not much in the way of spice in this beer and that suited me just fine. Mouthfeel was thick and creamy and rather low carbed, excellent for the big tastes and style. Once again, I found this to be a fantastic beer it remains at the top of my list. 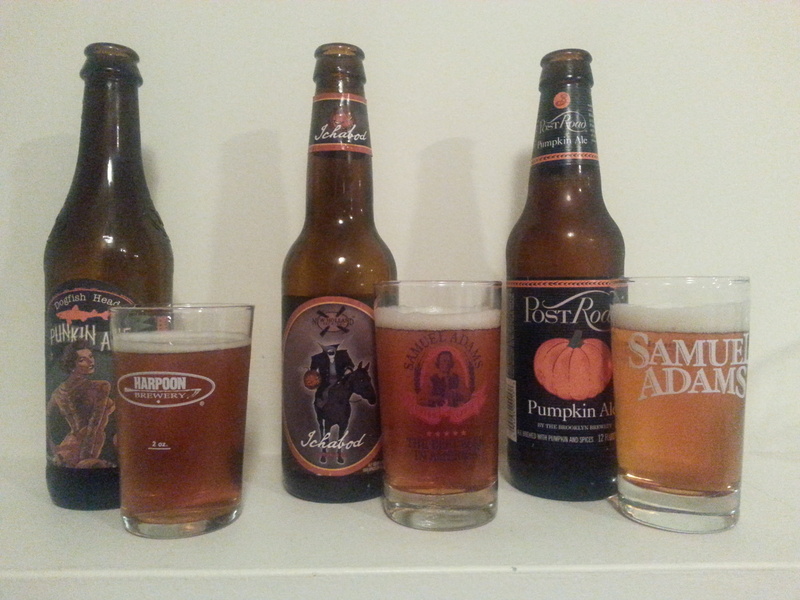 It is a good beer period, not just for a pumpkin offering. It is also now sold in 4 packs of 16 ounce cans which makes it an even nicer pick up for when a bomber is just a bit more than you are looking for. Highest recommendations for this one. After being sidetracked by a particularly busy week at work, it was time again to unwind with a new wave of pumpkin beers. The last batch ending on a somewhat promising note, so let’s see if that momentum called over into this set. The first beer of the night was Pumpkin UFO by Harpoon Brewery and I am happy to say it started things off on a high note. It poured a nice cloudy orange-copper body that right off the bat had me thinking about pumpkins. The smell was sweet and slightly vegetal with a very slight hint of spice. The taste, however, is where this beer really took off for me. It had a sweet, at times caramelly, malt backbone accompanied by vegetal pumpkin and light cinnamon/nutmeg spices. It had a smooth medium body with a slightly more than moderate amount of carbonation that suited the beer perfectly. Any more carb and it would have been too much, but for me they got it just right. No doubt my favorite pumpkin beer of the year so far. The next beer was unfortunately a letdown. It turned out to be Pumpkin Ale by Smuttynose Brewing Company and it lost me almost from the start. The amber/deep copper body wasn’t a problem, but the soapy smell backed up by strong hints of spice was a warning of things to come. The soapiness carried over into the taste and was followed up by sweet and toasty malts with an astringent allspice finish. I later drank some from the bottle to make sure it wasn’t my glass throwing off the taste, but alas, it was not. The soap did taste eventually mellow out a bit and give way to more sweetness if the beer was left to sit for a little while, but that was too little too late. This one was definitely a miss for me. Moving on. Closing out this round was another Pumpkin Ale, this one by Blue Point Brewing Company. While it was a step up from the previous offering, it was overall pretty uninspiring. It poured a dark amber/copper body and had a foamy head that stuck around for most of the drinking experience. This beer did not have much of a smell and only a very mild taste. Sweet malts and a hint of vegetal pumpkin upfront with a nutmeg and allspice finish that was thankfully also rather muted. Mouthfeel was kind of thick with a moderate amount of carbonation that suited the beer well. I don’t know that this would have been better with proportionally bolder tastes, but as offered I found the beer somewhat lacking. Non-offensive was the word that kept coming to mind when thinking about it, which while not bad, isn’t great either. It was a non-offensive pumpkin spice beer. Meh. Harpoon Brewery – Pumpkin UFO: First beer to break into the upper echelon, this had a great taste profile without the mouthfeel issues that the Magic Hat brew had last time. Blue Point Brewing Company – Pumpkin Ale: This was no doubt thoroughly average. Smuttynose Brewing Company – Pumpkin Ale: Drinking it after leaving it to sit just barely redeemed it from banishment to the lowest tier. I’d give it another try at some point, but won’t go out of my way to do so. Ranks above Pumpkin Batch because it at least did its job as a pumpkin beer. 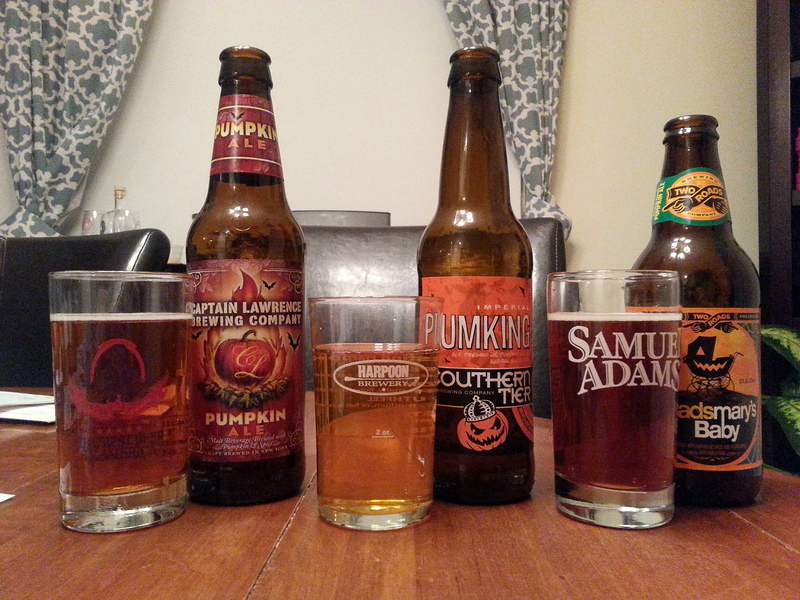 Southern Tier Brewing Company – Pumking: Still shuddering when I see it on shelves or Untappd.